For more than 100 years, Better Business Bureau has been a non-profit organization helping people find businesses, brands and charities they can trust. In 2017, people turned to BBB more than 160 million times for BBB Business Profiles on more than 5.2 million businesses and Charity Reports on 11,000 charities, all available for free at bbb.org. What is the BBB Accreditation? If a business has been accredited by the BBB, it means BBB has determined that the business meets accreditation standards. This includes a commitment to make a good faith effort to resolve any consumer complaints. BBB Accredited Businesses pay a fee for accreditation review and monitoring for continued compliance and for support of BBB services to the public. BBB ratings represent the BBB’s opinion of how the business is likely to interact with its customers. The BBB rating is based on information BBB is able to obtain about the business, including complaints received from the public. BBB assigns ratings from A+ (highest) to F (lowest). In some cases, BBB will not rate the business (indicated by an NR, or “No Rating”) for reasons that include insufficient information about a business or ongoing review/update of the business’s file. What is a BBB Business Profile? History & general information regarding the business: business creation date, names of principals, alternate names for the business, licensing information etc. What are the BBB Business Standards? The Children’s Online Privacy Protection Act (COPPA) is a law created to protect the privacy of children under 13. The Act was passed by the U.S. Congress in 1998 and took effect in April 2000. COPPA is enforced by the Federal Trade Commission (FTC). Because this BBB Student Video website is designed to target high school students, we have taken steps to ensure that personal information is not collected for children under the age of 13, or any age, without parental consent. Contest participants’ parents will complete and provide an electronic signature on an online parental consent form, in order to comply with COPPA. This comprehensive form will also include a credit card authorization that will serve as authentication of parental consent to participate in the program. We will only collect personal information when express parental consent has been given. The information collected should be used to create a digital login for each participant, and to contact the participant and his or her parents regarding the contest. Parents and student participants will also provide your BBB with intellectual property rights to the videos that they create. Each student’s parents and the student must give consent and permission to use the videos that have been created. A company’s brand represents their market identity—who they are, what they do, and how their product makes you feel. So, What is BBB’s brand promise? BBB helps people find businesses they can trust. Customers search businesses online at bbb.org before they buy products and services, and they look for the BBB Accredited Business seal, so they have confidence in the business’ ethics and business practices. The seal is a symbol of trust and a sign that BBB believes the business is trustworthy. Strong branding requires a consistent and clear message, clear communication of the brand promise, and use of certain approved language and graphics. Approved language and graphics are important because they help to convey the brand promise. Here is a list of approved language and graphics for the BBB logo and brand – and how to use them. Be sure to use them exactly as they appear. If a letter is capitalized, make sure that it stays capitalized. 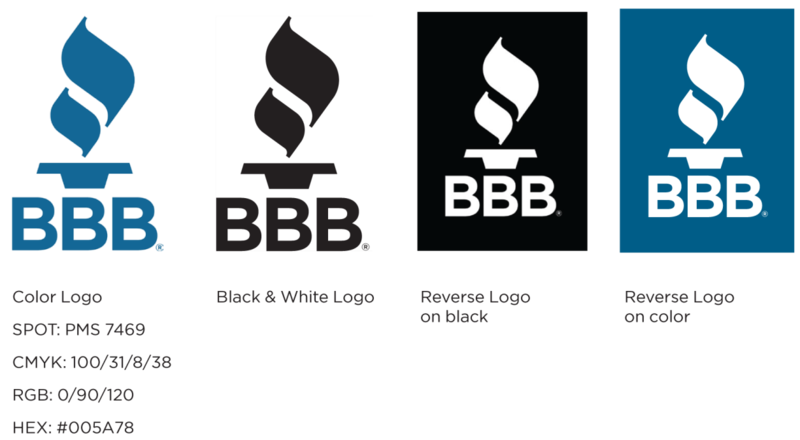 The BBB logo should only be in blue or black – as it appears below. The logo should be featured prominently in the video. If a trademark ® symbol appears near a word or phrase, be sure to include it. A trademark symbol means that a business has taken steps to make sure that it has a legal right to be the primary user of a word, phrase, or symbol. The public associates trademarked words or phrases with a business. Only the following BBB logos are allowed. Do not create other logos, images, or icons. These logos all have the trademark ® symbol. So that it can always be clearly seen, it is important that logos have a protected area around them. No colors or other graphics should be too close to the logo. Protected space allows the logo to remain easily recognizable. The logo should have a white background. Reverse logos (white logos) will have a blue or black background. FONT: Use Verdana font. Exactly as it appears in the logo. Capitalize the “W” in “With.” Blue or Black. *All logos will be available electronically for use in the videos.